One the PS1's unsung classics arrives on PSN this summer. 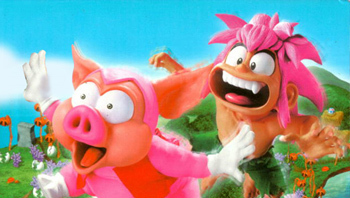 Getting your hands on a copy of Whoopee Camp's excellent swine-chewing sim and platformer, Tomba! (Tombi! if you're European) is currently a bit of a pain in the rear. The lowest priced copy on eBay will set you back $50, while a new copy is selling for a crazy $250. Not only that, but Tomba! was one of the handful of PS1 games that wasn't compatible with the PS2, meaning the game never quite got the following it deserved. Developed by Mega Man producer and Ghosts 'n Goblins director, Tokuro Fujiwara, Tomba! follows the adventures of the titular pink-haired cave man as he tries to retrieve his grandfather's bracelet from a horde of fascist bracelet-coveting pigs. The game is being released by Monkey Paw games, who also arranged the PSN release of Alundra and the Arc the Lad series. It took the company more than a year to acquire the rights to the title. "We often have to chase down multiple right holders," said CEO, John Greiner. "In this case, Sony and Whoopee Camp had rights that needed to be negotiated." The deal didn't necessarily include the sequel, however. "Tomba! 2Â is a possibility but we need to really sell Tomba! 1Â well before we can extend our relationship. It's the first time to work with Fujiwara-san so we're trying to make a good impression. Good sales have a way opening doors a bit wider." Since, like a lot of gamers, I keep my old consoles, I've never really seen the PSN re-releases of classic PS1 and PS2 games as particularly worthwhile. Nice, yes, but not something I'd consider essential to my gaming habit. Given Tomba! 's unique history, however, I think it may be the most significant classic release to date.